They brought in allies and operatives – many of them festooned with red armbands, without a hint of irony or historical perspective. They demanded that the vote be overseen by an outside observer – Syracuse Mayor Stephanie Miner. They enlisted the assistance of Governor Cuomo, who used surrogates to cajole and persuade the members of the Erie County Democratic Committee to replace outgoing chairman Len Lenihan with Frank Max of Cheektowaga. Max’s support came not just from the governor’s arm-twisting, but from two breakaway party factions. City Hall told the governor that it could work with Max, but not with Lenihan #2, Jeremy Zellner. The Steve Pigeon faction has a reasonably consistent alliance with city hall, because they share an anti-Lenihan sentiment. How did it work? When a committeeman arrived at Saturday’s reorganization meeting at the Hearthstone Manor, she was handed a ballot upon check-in. The ballot was turned over after the committeeperson had shown an entrance card and ID, and then signed a receipt acknowledging its receipt. Before you hop on the “Democrats are hypocrites” with respect to voter ID, voting for the chairman of your regulated private club isn’t the same as voting for an elected official. The latter invokes constitutional rights, the former does not. Each ballot contained the committeeperson’s name at the top, and weighted vote at the bottom. The list of candidates was printed in the center. The attendees ripped the top off, removing their name from the ballot, ticked the desired box, and dropped the ballot in a container. Each container was being watched by Max and Zellner representatives to ensure that there was no ballot-box stuffing. The weighted vote is more complicated. It was all calculated based on the number of people within a given election district. Some suburban voters had weighted votes of under 200, while some city voters had weighted votes in excess of 900. Max claims he won more ballots cast, that isn’t how the winner is calculated – Max and his faction knew this full well. One insider who was in the room tells me they didn’t even tally who received how many ballots cast in the counting room. Not only that, but they knew how the weighted votes were allocated and could have – but didn’t – file an objection of some sort in advance of the reorganization. The court case that’s being filed seems to center around the redistricting and reapportionment of the weighted vote in the Town of Amherst. Amherst’s town committee is led by Board of Elections Commissioner Dennis Ward, who is a Lenihan/Zellner partisan. But it’s not clear whether the allegation is that Ward did something wrong. Even Max attorney Peter Reese acknowledged to the Buffalo News that, “[Ward] used an arcane provision of election law to redistrict in Amherst to his advantage.” Election Law section 2-104 is “arcane“? Even arcane statutory provisions are valid, though, aren’t they? Ward rightly argues that the redistricting was done well in advance of the reorganization, and Max’s people had an equal opportunity to run people for new committee seats earlier this year, but didn’t. The charges of ballot-stuffing are vague and don’t name names – the police were not called, no one is being haled into court over it, and in this smartphone age, no one took so much as a snapshot. By failing to pre-emptively challenge the Amherst redistricting, and by calling in the state party committee to don a blue helmet and oversee the process, the complaints from the losing side seem to be nothing more than soreness and sour grapes. In fact, Miner – whom Frank Max asked to attend and oversee the process – was in charge of the counting room. If she did not raise an objection (and there’s no report that she did), the count was fair on its face. If part of their strategy was to challenge the procedural legitimacy, it flew in the Max camp’s face. That explains why the allegations of counting improprieties are relegated to rumor and won’t be part of the litigation. It would be great if the Democratic party in Erie County could be unified, but any such unity is a three-way street. Conspicuous in their absence were any mouth-noises from the Pigeon or Brown camps about pledging to work with the ultimate winner. (Zellner and Max pledged to work with anyone, to their credit). To Pigeon and Brown, this is part of a decade-long effort to wrest control of the party apparatus back even though Lenihan found it in debt and utter disarray. Over ten years, almost always fighting a war on two fronts – against Republicans and breakaway Democratic factions, Lenihan navigated the party ship to a scandal-free path of successes that would have been unthinkable ten years ago. It would be great if the party could now unify behind Zellner, but no one’s holding their breath. 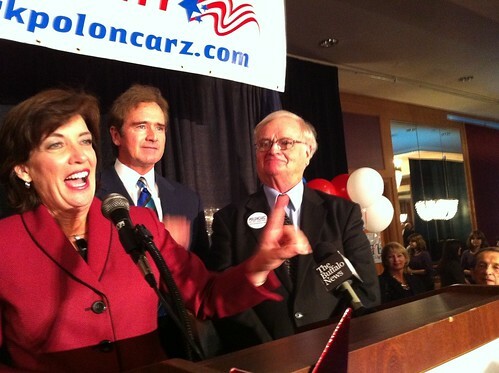 Zellner is more pitbull to Lenihan’s likeable teddy bear, and has alienated many party stalwarts. The likelihood of these people shrugging off their personal bias in favor of party unity is slight. The Cuomo camp will have to reassess how wise it was to attempt to cajole and bully party loyalists to do something they couldn’t do in good conscience. The governor is alleged to have held up big civic issues such as the Bills lease over this idiotic party battle. If accurate, holding the entire community hostage over a party squabble is rank governmental malpractice. Party politics is by its very nature a massive battlefield of competing egos, and Erie County Democrats have proven time and again that these egos are most often unreconcilable. Maybe that conflicted status quo is better than the alternative.